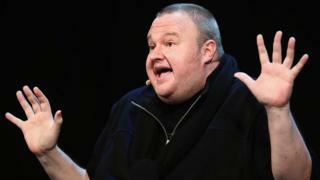 Internet entrepreneur Kim Dotcom has announced that he would like to build a new social network. He described Facebook and Twitter as "deep state conspirators" and said it was "time for something better". Writing on Twitter, he also invited CIA whistleblower Edward Snowden, Wikileaks founder Julian Assange and the German hacker association Chaos Computer Club (CCC) to join him. Mr Dotcom is currently fighting extradition to the US from New Zealand. He is wanted there to stand trial for copyright infringement and fraud, which he has consistently denied. "All it takes is a real alternative with real privacy protection and zero censorship from a trusted source and Twitter will become the next MySpace, an online ghost town," he tweeted. Mr Dotcom conducted a Twitter poll asking his 732,000 followers whether Twitter was "in bed with the deep state" and 89% of just under 20,000 voters responded yes. Cyber-security expert Prof Alan Woodward, from Surrey University, said the issue revolved around trust. "Do you trust Kim Dotcom, Julian Assange, et al more than those running Twitter, Facebook?" he said. "All these networks go through growing pains and I suspect that Facebook and Twitter have learned a few lessons recently. Perhaps any new social network would simply have to learn in the same way. "Maybe this is a case of better the devil you know than the devil you don't."